The K-State Black Student Union announces civil rights activist and published author Angela Davis will deliver the annual Black History Month keynote address at 7:30 p.m. Feb. 1 in the K-State Student Union's Grand Ballroom. Doors will open at 6:45 p.m. The topic of Davis' lecture will be "Institutional Racism & Criminal Justice System." Davis is most known for her advocacy for gender equality, prison reform and alliances across color lines. She is the author of nine books, including "Blues Legacies and Black Feminism" and "Are Prisons Obsolete?" 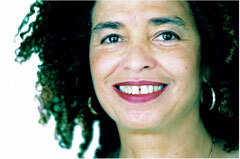 As of late, Davis has been working diligently to change social issues associated with incarceration and the penal system, speaking mostly from her experience of incarceration in the 1970s. Davis encourages audiences to challenge ideas of incarceration and to think toward the possibility of a world without prisons. In addition, BSU will host a bevy of other events for the K-State community, including "The First, The Only, The Obamas," a President's Day tribute to the Obama family, and the annual "Soul Café" poetry slam, headlined by national award winning poet Crystal Valentine. The theme for Black History Month is "Thirsty for Knowledge, Hungry for Change." For more information and frequent updates on all Black History Month activities, please see BSU's OrgSync page and social media outlets.